As with many other Essex villages within the Buchanan Triangle, Wickford was a farming village, of Saxon origin. Wick means "a winding river" and "Ford" is a shallow river crossing. There are other meanings given to the village name, but this one seems to fit the area. The agricultural depression and the industrial revolution led to a decline in farming and related trades. The loss of this traditional livelihood in the area meant that workers had to look elsewhere for a living. In the 1880s, the arrival of the railway played a big part in changing Wickford from a farming village with a livestock market, to an urban town with commuters travelling daily to London and other industrial areas. To facilitate the construction of the railway, adjacent farmland was compulsorily purchased. Due to the sharp decline in agriculture within the area, in later years much of Wickford's farmland, was sold to private real estate companies. This new real estate was then divided into small plots (plotlands) thereby enabling a profit to be obtained by selling to local people, who otherwise lacked the finances to purchase. One such plotland was the Cranfield Park Estate, which the Wick Housing Estate now occupies, and provides homes for approximately 2000 people. By the latter half of the 20th Century the plotlands fell largely into disuse. After several changes of ownership and with the ever-increasing need for housing, The Wick Housing Estate was built. The land that now constitutes the Wick Country Park was purchased and set aside for public recreation by Basildon District Council, the choice being whittled down to several sports fields or a Country Park. The final decision was left to the vote of the Wick Community and by the turn of the 21st Century the Wick Country Park (at least as a concept) was born. Historically the land, which is now The Wick Country Park, belonged to Fanton Hall Manor. (The Hall still remains and is visible to the east of the Park). The land was previously used primarily for the grazing of cattle up until the late 1950s, with additional usage given over to wartime defence. From the late 50s, the estate came under its current ownership and production then went over to mixed farming with cattle and arable (wheat, barley and a small proportion of maize). It is worth noting that the hedgerow surrounding the Park has been in existence for at least two generations, while the hedgerow flanking the brook is likely to be a remnant of the time when the area was wooded and has therefore never been cleared entirely, if at all. 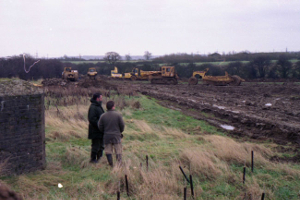 After some initial 'fringe' work, work specific to the creation of a country park began in 2001. 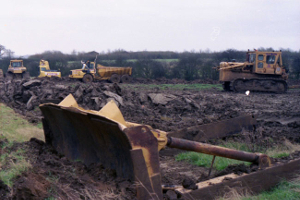 Work began on landscaping several agricultural fields to create the contours of the Park we see today. Heavy plant (not the botanical variety) appeared to dig, scrape and dump soil and clay around the site. 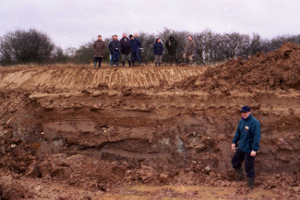 It was a very wet autumn and soon the site became a sea of mud. By December 2002 the Park was officially open, though work continues to this very day. In designing the Park it was decided to leave the pillboxes in place as they were a physical reminder of the Park's history. They also provided an opportunity to create roosts for bats once the doors and windows had almost been blocked up. 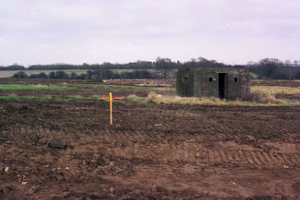 The old photo also shows the wooden markers indicating where the large ditch had to be dug, running across the lake. 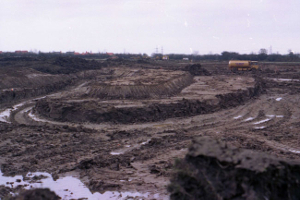 The biggest landscaping job in the making of the Wick Country Park was the excavation of the lake. The second and fourth pictures were taken from the east side of the lake looking north towards the main entrance. 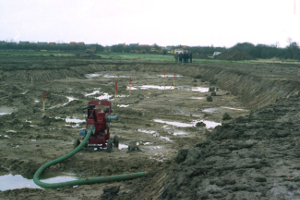 In the winter of 2001/2 there was so much rain that the bed of the lake started filling with water before the excavation was completed and pumps had to be brought in to remove all the water. By the summer of 2008 the lake was full of water, had been stocked with fish and attracted a wide range of wildlife. It was intended to serve as both a nature reserve and a fishing lake. To achieve this dual function, the bed of the lake was excavated to three different levels. The shallowest level would enable the growth of the reed Phragmites but the reed could not grow at depth, so the deeper parts of the lake would remain reed free and available for anglers. One photo taken in 2001 shows the different levels that were cut into the clay to form the bed of the lake. The latter photo taken in 2008 looking over the same area, shows how Phragmites have colonised the shallow perimeter of the lake, whilst the deeper waters remain clear of reed. The deepest part of the lake is well over 3 metres deep, which not only prevents reed growth, but it also provides deep water in which fish can survive harsh winters. Furthermore, it also provides some security for any birds nesting on the island by preventing people from wading out. Many thanks to Cliff Thornton in conjunction with Park Ranger, Mark Williams, for providing these pictures along with the history of the Park's creation.